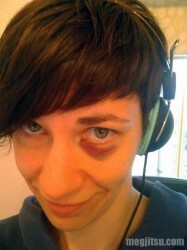 Last week’s training left me with an impressive shiner. Some sort of freak-accident occurred during no-gi rolling that left me with a highly coloured bloom under my left eye; there was no violence or craziness, I didn’t feel it happen and there was no irritation to the eyeball to indicate a finger or toe collision – I only realised there was swelling after about a minute’s wondering what I could see out of the corner of my eye. While each day the colour recedes, I’ve been carrying this puppy around with me for 10 days and reckon it won’t be fully cleared until next week. Over the course of the last ten days, my shiner has given me pause to reflect on the experiences of those women who come to their shiners in less innocent fashion. I’ve encountered everything from curious glances to concerned questions over how I came to have a black eye to extreme awkwardness in those less able to cope with discomfort over the dark implications of a bruised eye. I would not presume to suggest that I’ve walked in the shoes of a woman who has experienced physical abuse. However, the mix of judgment and concern I’ve come across has certainly prompted me to be more mindful of the reality of violence against women. Women’s Aid claims that 1 in 4 women will experience domestic violence in her lifetime (often repeatedly); one incident of domestic violence is reported to the police every minute; an average of two women a week are killed by a current or former male partner. What can we do? I’m not sure either passing judgment or pitiful looks are effective strategies. For my part I made a small donation to my hometown’s women’s shelter, Alternatives for Battered Women in Rochester, NY. The economy has meant tough times for many people and charitable organisations have felt the pinch as giving has decreased. Many local groups could use your help. Money – even modest amounts – is always needed, but shelters like the ABW also post wish lists of goods you might be able to donate. Consider taking action in your community, perhaps you have time or money or skills that could help those in need.